Lamu Old Town is the oldest and best preserved example of Swahili settlement in East Africa: it has maintained its social and cultural integrity, as well as retaining its authentic building fabric up to the present day. Once the most important trade centre in East Africa, Lamu has exercised an important influence in cultural as well as in technical terms. Characterized as being a conservative and closed society, Lamu has retained an important religious function with annual celebrations, and it is also a significant centre for education in Islamic and Swahili culture. Compared with Zanzibar, Lamu has been more conservative and therefore has also best preserved its particular Swahili character. In August 2016, I flew on Airkenya Express from Nairobi to Lamu. I ignored at my peril the admonishment on Airkenya's ticket to only travel with soft-sided luggage. Airkenya apparently runs an ancillary business selling soft-sided luggage to tourists as they immediately offered to sell me a duffel bag, in which I repacked my belongings, and they stowed my hard-sided suitcase until my return. (I ended up donating the Airkenya-branded duffel bag later in my trip to the guide who accompanied me during my visit to Kibera, the largest slum in Nairobi, so it was money well spent.) Lamu Airport is located on an island across the channel from Lamu's old town, and ferries await arriving passengers for the 10-minute crossing. I stayed at Subira House, which was built 200 years ago by the governor of the Sultan of Zanzibar (http://www.subirahouse.com). Due to Lamu's proximity to Somalia and some recent incidents, there were very few tourists in Lamu and I was the only guest at Subira House. The highlights in Lamu were wandering around the old town, visiting the Donkey Sanctuary, which works to improve the health and condition of Lamu's principal means of transport (https://www.thedonkeysanctuary.org.uk/project/lamu), and eating and drinking at Peponi Hotel in nearby Shela village (http://www.peponi-lamu.com). Other than for its population of 5,000 donkeys roaming the narrow streets among kanzu-clad men and women in flowing buibui robes and 40 mosques, Lamu looks like any other ancient Islamic town. The only motor vehicles in the ancient centre are a Land Rover belonging to the District Commissioner and a tractor owned by Lamu County Council. 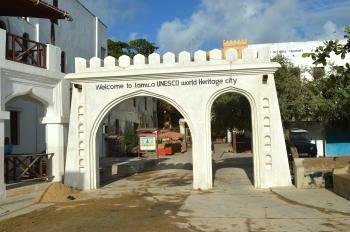 Yet Lamu is a Mecca of sorts. More than 20,000 Muslims visit Lamu annually to mark the holy Maulidi Festival that also attracts tourists from East and Central Africa, Europe, North America, the Indian sub-continent and the Middle East every August. 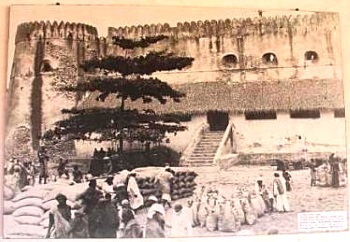 Fusion: "The town is characterized by narrow streets and magnificent stone buildings with impressive curved doors, influenced by unique fusion of Swahili, Arabic, Persian, Indian and European building styles."